The Endurance thrillingly recounts one of the last great adventures in the Heroic Age of exploration--perhaps the greatest of them all. In August 1914, days before the outbreak of the First World War, the renowned explorer Ernest Shackleton and a crew of twenty-seven set sail for the South Atlantic in pursuit of the last unclaimed prize in the history of exploration: the first crossing on foot of the Antarctic continent. Weaving a treacherous path through the freezing Weddell Sea, they had come within eighty-five miles of their destination when their ship, Endurance, was trapped fast in the ice pack. Soon the ship was crushed like matchwood, leaving the crew stranded on the floes. Their ordeal would last for twenty months, and they would make two near-fatal attempts to escape by open boat before their final rescue. Drawing upon previously unavailable sources, Caroline Alexander gives us a riveting account of Shackleton's expedition--one of history's greatest epics of survival. And she presents the astonishing work of Frank Hurley, the Australian photographer whose visual record of the adventure has never before been published comprehensively. Together, text and image re-create the terrible beauty of Antarctica, the awful destruction of the ship, and the crew's heroic daily struggle to stay alive, a miracle achieved largely through Shackleton's inspiring leadership. The survival of Hurley's remarkable images is scarcely less miraculous: The original glass plate negatives, from which most of the book's illustrations are superbly reproduced, were stored in hermetically sealed canisters that survived months on the ice floes, a week in an open boat on the polar seas, and several more months buried in the snows of a rocky outcrop called Elephant Island. Finally Hurley was forced to abandon his professional equipment; he captured some of the most unforgettable images of the struggle with a pocket camera and three rolls of Kodak film. Published in conjunction with the American Museum of Natural History's landmark exhibition on Shackleton's journey, The Endurance thrillingly recounts one of the last great adventures in the Heroic Age of exploration--perhaps the greatest of them all. The captain of the ship, Frank Worsley, would remember the day vividly ever afterward. It was July, midwinter in Antarctica, and the darkness of the long polar night had been upon them for many weeks. The temperature was -30 Fahrenheit, and around the ship, extending to the horizon in all directions, was a sea of ice, white and mysterious under the clear, hard stars. From time to time, the shriek of the wind outside broke all conversation. Away in the distance, the ice would groan, and Worsley and his two companions would listen to its ominous voice as it travelled to them across the frozen miles. Sometimes, the little ship would quiver and groan in response, her wooden timbers straining as the pressure from millions of tons of ice, set in motion by some faraway disturbance, at last reached her resting place and nipped at her resilient sides. One of the three men spoke. A story of will, courage and grit. What makes it even more stirring are the starkly elegant images. This is a great story of hardship, loyalty and fight for survival. Very well told and very hard not to be impressed... or even in awe of Schackleton and his crew on The Endurance. Worth the read - indeed. This is a horrible book, the first 100 pages are sooo boring. But the book is good after it. The author needs to grab readers attention there. 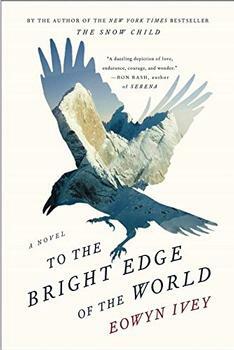 From the bestselling author of The Snow Child, a thrilling tale of historical adventure set in the Alaskan wilderness.